This recipe comes together quickly! The way I figure, if you've got a rainbow of colors in veggies then its a good thing! I promise I will not make anything that lacks in flavor! 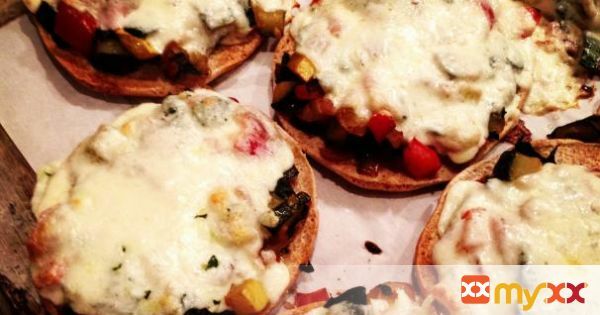 These Veggie Melts came out so good and were a big hit with the hubs, brother and future sis in law! And I have to say I absolutely love these Arnolds Multi Grain Sandwich Thins that I used here as the base!! They are only 100 calories and have a very slight sweetness to them that is so yummy! If you aren't a huge fan of certain veggies that I use here, go ahead and switch out for what you love! You could even use a portobello mushroom cap in place of the sandwich thin! 1. Oven at 375 degrees. 2. In a large saute pan, over medium heat, add in a few drizzles of olive oil. Toss in the garlic, onion, zucchini, squash, and red peppers. Season with salt and pepper. Cook until softened. 3. Stir in the spinach and cook just until wilted, a couple of minutes. 4. Open up each sandwich thin and place onto a baking sheet. Pile the veggies over the 10 halves as equally as possible. 5. Place a slice of mozzarella over each round. Drizzle lightly with olive oil. Bake for approx 15 minutes until the sandwich thins are lightly crisp and the cheese is melted.